If the crowd at the H Mart Grand Opening is a sign of things to come, you can bet this Asian supermarket is going to be a game changing retailer in Central Square. Flat screen TV’s , sleek design, a fresh fish market, prepared foods, exotic produce, sit down food court, and a clean, aesthetically appealing appearance, will make this supermarket a destination for many Cantabrigians and residents from surrounding communities. On Wednesday, lines for Go! Go! Curry! 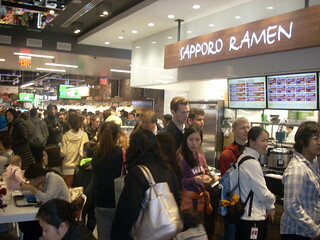 and Sapporo Ramen were out the door. Looks like Central Square finally got its anchor store! Looking for fresh bread? 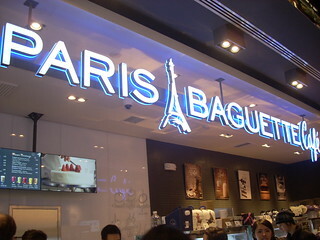 Paris Baguette sells artisan breads, cakes, pastries and sandwiches. You can even look in the peek-a-boo window to see the bakers hard at work. Handsomely boxed desserts offer quick gifts if you’re on your way to a dinner party. Lattes, coffees and fruit smoothies are available, too! 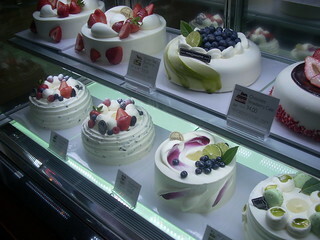 Decorated cakes are beautifully presented at Paris Baguette. 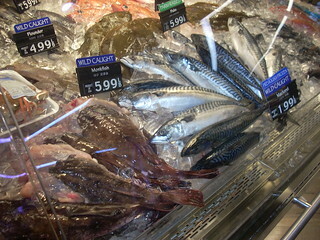 The fresh fish market sells live fluke and lobster, along with a bevy of other fresh fish. Hundreds of sauces and marinades, including the ubiquitous Sriracha sauce, line the shelves. 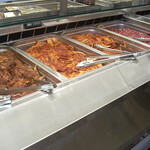 A variety of pre-marinated meats are sold by the pound including pork bellies and beef bulgogi. 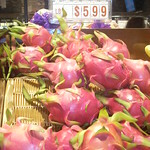 Hard to find produce, like dragon fruit and other Asian fruits and veggies, are offered alongside conventional and organic produce. The store also offers the basic staples like yogurt, milk, juice, etc. This store is the second H Mart in Massachusetts, the other is located in Burlington. Despite the Cambridge location being much smaller than Burlington’s, the store still offers a wide variety of both food and non-food products, including a plethora of rice cookers, kitchen utensils, basic cleaning products and Asian style dishware. For those who have complained about wanting a store in Central that “you can just buy socks and underwear” in….well, guess what? They even sell men’s underwear (sorry, no socks)! Located at 581 Mass. 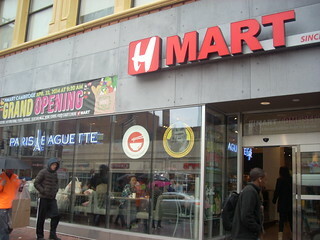 Ave. and just steps from the Central Red Line stop, H Mart is an easy destination for pedestrians and T riders. Taking the MBTA is strongly suggested since public parking is extremely limited. Though billed by the City as a new “neighborhood” supermarket, most people who have been to the H Mart in Burlington, or who have ties to the Asian community, knew this store would attract crowds from Boston and the surrounding communities. With cars idling in front of fire hydrants and in illegal spots, the City will have to come up with some creative ideas to address additional parking needs and step up enforcement of parking restrictions. You can bet area residents will be voicing their concerns! Parking is available at the Green St. Garage and two nearby city parking lots. Both nearby parking lots have been at 100% capacity since the opening. Deputy Marketing Manager, David Shin, said negotiating talks are ongoing with Intercontinental (manager of a nearby private parking lot) for additional parking to accommodate the store’s customers. The Cambridge H Mart is clean, sleek, well stocked and very organized. This store will raise the bar, in an already competitive food market, for Central’s three other food markets: Star, Whole Foods and the iconic Harvest Co-Op. How these stores will fare and adjust, only time will tell. Libby’s Liquors was proactive in adapting to the new retail environment; they created a new entrance at the back of their store in order to take advantage of H Mart’s foot traffic and installed a new eatery, due to open soon! a) Who at Han Ah Reum H Mart are the best goto folks for information and details about the foods and products available?... For example, b) Where do you find Turmeric Tea?... c) How do different folks prepare Natto ?... d) What Natto brand/s are best?... and without the corn syrup! e) On a continuing basis improve the Hanahreum H Mart experience. f) Turn down deafening music loudspeakers, control noise acoustics with acoustical materials for a better shopping experience and for a better workplace for the staff ! Thank you for this! Nice page layout! I have just returned from visiting the new HMart in Central Square and I have one word of advice for those Cantabrigians eager to follow in my footsteps—DON'T! In brutal honesty, I found the experience unsetttling to both my sensibilities and nerve endings. The store, which is quite sleek and modernistic in its decor, isn't large enough for the crowds drawn to its offering of exotic foods and Asian delicacies. The noise factor approaches 11 on the 1-10 noise meter, there being a total absence of any sound absorption materials in the environment. There is much neon flash and flat screen distraction to add to the air of chaos and exhausting visual noise. One is forced to negotiate through aisles too skinny for the shoppers, much less the plentiful number of stations where samples are offered by workers whose English skills defy their attempts to convey what is actually being offered. I could go on and on, but I will leave off with a simple suggestion—double the size of the place and add some sound-abosrbing fabric and materials and maybe, just maybe, you'll get me to come in for HMart's great food selection and exotic offerings. Your consistent jackassery is without end. That being said I concur with the general consensus that H-Mart is a godsend! My wife and I cruised through there yesterday for the first time. We met a lovely woman from Ohio who was hanging out in Central while he daughter was at Harvard attending a conference. I bought three of the largest honey crisp apples I have ever seen and a Belgian waffle at the coffee house section. All were fantastic. I love especially that they open early and the selection destroys anything in the area. I can't wait until I make up an excuse to go again. ...also I wanted to mention that there is this awesome weird "meat salad bar" in the grocery store that I was unready for...however my grill is now primed and I look forward to a rematch. Lastly, 9mo old boy Jed was with me in the a.m. (he wakes up at four with the goal of driving me mad) and was sleeping like a little lamb whilst I was jumping up and down the isles with his mamma. Isles which were human sized and appropriate to walk down two abreast...with music in the air that couldn't shake my little guy's slumber. I'm supposed to be studying right now...and all I want to do is go back to HMart! Curiously, I agree with Paul Steven Stone about the experience of shopping at H-Mart. I found it unpleasant. But there our agreement stops. Diversity means accepting that how one experiences the world might not define how everyone experiences the world. There may well be people who enjoy the elements of H-Mart I don't. There are certainly people who consider being able to acquire what H-Mart sells to be worth the experience. His "DON"T" says more about his own view of diversity than anyone could ever write. Saul did you see the meat salad bar? Public Transit in Central Square, It’s Time to Think Big! The squeeze on parking in Central Square just got a little tighter.